Hello Dear Reader and welcome to this journal about helping the Bees! A few weeks from now I will be receiving my bees. I planted fruit trees two years ago and then built a small ‘grapeyard’ (Frontenac vines developed at the University of Minnesota) and because of the world situation, fact or fiction, about the declining numbers of pollinators and flying insects, to better the odds of my hobbyist activities for shiny red apples and huge clusters of purpley grapes, I am thinking I need some bees. Although I practice one of the most arcane professions out there, architecture, I am still basically a farmer by my DNA. Nothing gives me more solace and happiness than a day just “messing about” on my piece of earth down here by the Kaministiquia River in Thunder Bay. 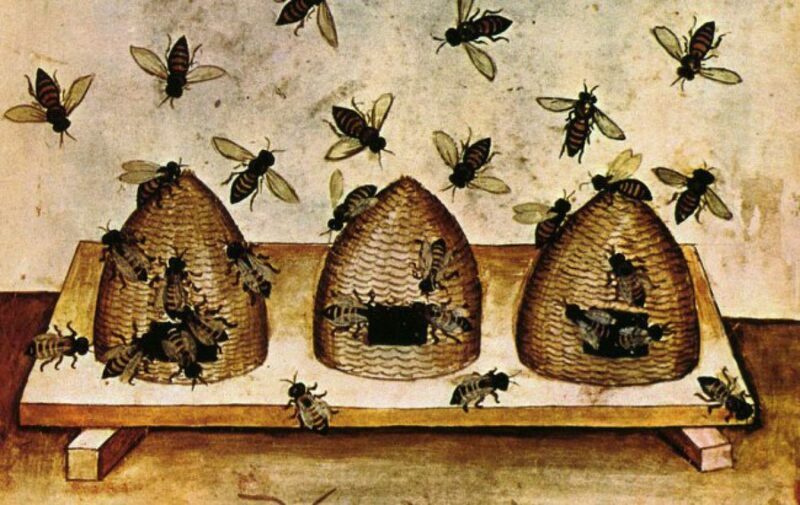 Bees were a part of childhood dwelling on a farm in southern Ontario summers. The hives were situated in an aging apple orchard, the gnarled trees were scaled for small children as we scampered under the friendly arms untouched. Grownups had to step off the worn dirt path to skirt their branches. I caught my first cottontail bunny by reaching under a beehive set upon concrete blocks in that orchard. Timing was everything in that steady stream of bees.“Be still! and don’t flail your arms” my mother warned when we were in the presence of the wingéd ones with stingers. We took heed. I suppose these are my bee credentials to suit up for this endeavour, and yes I already got the hat. The new outfits for beekeeping have gone all astronaut. The helmet-like affair with netting and strips of techno reinforcing strengthens the metaphor for ‘Spaceship Earth’ as all the alarms are going off. What can one believe anymore, what is really going on? If one is unsure about where they stand about the reasons for climate change our continuing dependence on chemicals to boost up crop yields, disrupt nervous systems of crop-chomping insectivore and slaying forest floor competition has not diminished since Rachel Carson’s warning back in 1962. Her book ‘Silent Spring’ changed the paradigm of Life on the planet. The banned use of DDT was a tipping point for that era. The life of bees, the pollinators of all that we eat from our cornucopia of plants and all the problems we now understand about their health and well-being, may well be the next wave of change in our world. The president’s report in the May and June issue of Ontario Bee Journal informs that pollen residue samplings for pesticides shows 92% neonics- our bees are foraging in a toxic environment1. The courses and workshops are filling up for beekeeping in Ontario. Torontonians are setting up hives in their urban backyards, go-pros beam back to apps on cell phones to keep tabs on their hives while city beekeepers assemble around conference tables. Could it be, that our own macro civilization, must now kneel down to this alternate civilization, set up on blocks in an apple orchard, in order to mend, perhaps even save humankind from its own extinction? To produce two pounds of honey, bees travel a distance equal to 4 times around the earth. Our rocky blue planet is 40, 075 kilometers in circumference (24,901 miles). 1 Dr. Amro Zayed, OMAFRA, MOECC. My bees will be late. I got the email a few days ago. The two ‘nucs’ as they are called, the correct nomenclature for a group of workers with their Queen have yet to ‘hatch’. I believe the reason for this is because of the cold spring and I see by today’s press release, Thunder Bay’s Chronicle Journal quotes the President of Ontario Beekeeper’s Association Jim Coneybeare (really? rather close to Honey Bear) I digress. Keeping Bees is looking like another not an exact science and I will soon be humbled, even if I have read everything available, listened to everyone and leaned close to my Mentor: ‘Honey Bear’ himself: Mr. Barry Tabor of Shuniah, mistakes will be made. Are there wetland plants growing in the immediate area? does a river count? Is there a natural, year-round source of water within 1,000 feet of your colony? river? Would the entrance at least 25 feet away from your neighbours properties? ok. Speaking of Bears. The Kam River is a veritable highway for all sizes of bruins. A few days ago we had Momma Bear and THREE cubs checking out everything here. I cringe to think of their future. Please let them be. If there is something ‘smelly’ on your property, they will be back. This of course is problematic for the beehives which will have to be situated in a compound that we must electrify, solar powered of course. Bears GO INSANE once they get a taste of that honey. Design-wise on that checklist, I lack a windbreak for my hives and a curving fence is envisioned, that the hives back onto, with enough space for the keeper (moi) to manoeuvre and check the hives. The first question I asked Barry Tabor of ‘Bears, Bees and Honey’ in Shuniah, Ontario, just east of Thunder Bay was: “What makes a good beekeeper?” He hesitated: “You must be conscientious”, meaning keep an eye on what’s going on inside. I will up that word choice to vigilance. The Bee Dance. I am bedazzled in wonderment of all I am discovering about the world of bees. I walk in the footsteps of humanity since what four?, six? thousand years of settlement civilization. Before that, we were like bears raiding their hanging clusters of honey filled combs. >>>BULLETIN>>>>>My romantic delusions have been tempered by breaking news on all fronts about the disastrous winter for bees. The numbers are still coming in at 70% losses. GMO crops are not helping as they are laced with neonics. The best-selling pesticides, Imidacloprid and Clothianidin, are manufactured by Bayer. What a recurring nightmare! Rachel Carson warned us about chemical companies and the future. In her time it was DDT- our ‘Silent Spring’ this year is silent beehives. I may not even receive my bees. If you have dandelions, please do not chop their heads off, it is the first pollen and nectar for the honey bees, what’s left of them. Things sound grim indeed, as we do not have enough warmth of season for them to recover. I will write about the dance soon. Yesterday, June 16th 2018, I picked up my ‘nucs’ (2) in Shuniah from Barry Tabor, Beekeeper (Bears, Bees and Honey) at about 1:00 pm. Many hours later, due to unforeseen ‘circumstances’, the bees, their little heads (and yes I have anthropomorphized them) trying to push their way through the grid holes of a 4×4 inch square of netting in their 4-frame box, the sound, emanating from the box says: PLEEEEZ LET US OUT!!!! The transfer proceeded smoothly without gloves. The bees alighted on my hands and explored about with their particular gait (and yes, that’s funny too, a kind of tu-dunk-ka-dunka-dunka (bee swagger), someone pooped on the tip-top of my veiled Beekeeper’s hat (a message?) and I was speaking to them the entire time, welcoming them to our place, telling them I hope they would like it here and other nonsense I could come up with while lifting loaded brood frames covered with bees and placing them into the new wood hives, while my husband Craig and Kaya-dog watched from a safe distance outside the ‘bee compound’ (also the Vineyard). I have done this before I think. June 21, 2018 Happy Summer Solstice all you Pagans! About four in the afternoon now, the entrances to the hives are so crowded with arrivals from the ‘airforce’, that I was concerned and phoned my Mentor to make sure it wasn’t a ‘robbery’. “Just open up the entrance” he advised. They are heading in a south west direction, to the Poplar forest. I wonder what they have found. Early Tuesday morning, someone arrived with bright yellow pollen pouches on their legs. WHY am I so emotional about that? There is much to observe at the comings and goings of the hive. I am due to make my first inspection either tomorrow or the next day, it will be important. I did see some weird cells that looked a little large, perhaps developing Queen cells as the Queen for each hive was packaged in a plastic capsule so she wouldn’t ‘get lost’. It is already a leap of faith that both hives are working forward with a healthy, accepted, laying Queen. I have been to the hives, without the garbe, without the gloves, to make some minor adjustments (painting that wood I didn’t expect to see from the cover which is holding the upside down Mason Jar punched with nail holes of 1:1 sugar syrup). A scout (guard?) bee will fly up and hover in front of me and then return to the hive entrance. I laugh and fill in the conversation: “Oh, it’s just her“. The Bees of June work the hardest and these four o’clock returning Foragers will not see the end of July, their wing muscles worn out. A Honey Bee may fly out for 5 minutes or two and a half hours and visit about 75 – 3,000 flowers. One pound of honey is the result of forager bees collecting nectar from 2 million flowers. The life of one honey bee produces 1/12th of a teaspoon, 5 drops of honey. Be safe beautiful little creatures!